Cheeky Seats is a small boutique tailoring company... Like two people and a dog kind of small. One of the things that surprises folks a little is when we tell them: We are not upholsterers. We don't raise, lower or reshape seats. We don't do foam rebuilding. That is not our area of expertise. We specialize in fabric construction, and the combination of colors and textures in unique ways. It might sound strange, but we consider what we do to be tailoring "garments" for your scooter. We like to think that we are creating your "red carpet" look. We tailor seat covers that fit superbly without the need for staples, and in giving you the freedom to change your look in an instant. We are interested in the way our product enhances the beauty of your scooter, and of YOU. 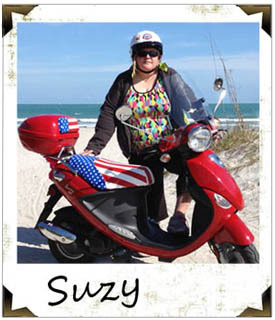 Most of all, we're interested in helping you personalize your scooter and how that makes you feel. Rafa is a 3rd Generation Tailor. Born in Puebla, Mexico, he learned to sew in the family business, making blue jeans. His experience and knowledge of sewing techniques and construction is nothing short of incredible. Growing up in the garment business, young Rafa had many annoying sewing related chores. The story goes that when Rafa came of age, he dramatically proclaimed that he would "Never Sew Again!" 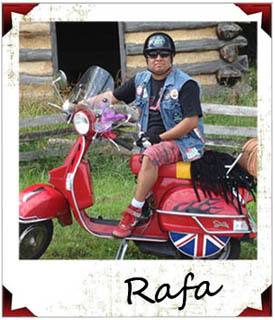 Rafa rides a 2003 Stella 2T, but can sometimes be caught tootling around town on a Honda Metropolitan. Rafa is also an accomplished dancer, and makes killer authentic Mexican food. He likes to take selfies. Howdy. 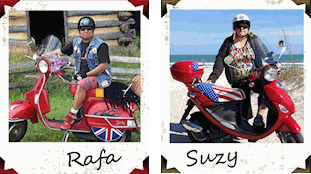 I'm Suzy and unlike Rafa, I grew up going to summer camp and learning how to make things with popsicle sticks and macrame. I started sewing to make my own bohemian clothes in "Home Economics", which was exceedingly uncool at the time. I later went on to get a BFA in Sculpture from Temple University's Tyler School of Art. As part of that curriculum, I spent a year living in Rome, Italy, where I fell in love with scooters. I was mesmerized by the riders; impeccably clad men and women coming and going with such ease and grace. They made life look so...effortless. I would sit in the cafe and watch them glide by, and daydream of living that lifestyle. Little did I know that one day my whole world would revolve around scooters! I am the designer, storyteller, and computer geek of this operation. I ride a Buddy 125.